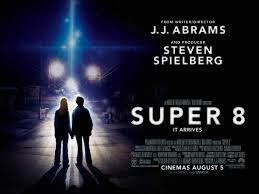 “Super 8” is director J.J. Abrams’s loving tribute to Stephen Spielberg’s films of childhood wonder, films like “E.T. The Extraterrestrial,” “Close Encounters of The Third Kind,” and “The Goonies.” It’s sort of fitting that Spielberg produced his own homage. In Lillian, Ohio, a group of middle-school kids are working on a film to enter in the Cleveland International Super 8 Film Festival. The group has a Spielbergian/Stephen Kingesque mix of non-cool kids: the chubby one is the filmmaker. There’s also the smart geek, the spaz, and the misunderstood quiet kid. Naturally, they need to bring in another person to flesh-out their troupe: the girl. One night, they sneak out at midnight to film down by the train station. The Girl—Elle Fanning—proves that despite her being from the wrong side of town, she can really act. Lo, and behold, they spy a train coming, and hustle to get the shot reset. They shoot as the train rushes by. There’s a crash and the train derails. What happens then—how the group bands together to save each other amidst a chaos of weird happenings, the scary military, and people gone missing—is as much fun as Spielberg in his prime. Maybe even more fun. Among the grown-ups, Kyle Chandler stands out as Deputy Jackson Lamb, a good man trying to deal with being newly widowed. His son is “misunderstood quiet kid” Joe Lamb (Joel Courtney, in a wonderfully understated performance), and we are—of course—ultimately left with the sense that the two will bond and survive their shared loss. The special effects are pretty awesome in “Super 8.” A lot of the scenes reminded me of “Close Encounters,” where Richard Dreyfus’s power truck died at a railway crossing, the stop sign vibrated back and forth, radios changing stations, etc. Good stuff. “Super 8” filled me with nostalgia. The movie is set in 1979, and I was about the same age as the characters. I remember Blondie’s “Heart of Glass” and—ye gods—“My Sharona” playing on the radio. It was a simpler, easier time. In a few decades, today’s thirteen-year-olds will no doubt have a film looking back on their halcyon youth in innocent 2013. I hope theirs is as much fun as “Super 8” was for me. This entry was posted in Coming of Age Film, Films, Science Fiction/Fantasy. Bookmark the permalink. I enjoyed the nostalgic feel and I liked the characters and story-telling. I thought the ending backed off into cliche-ville a little — as if Abrams was afraid to do something daring with it (I’ve felt this about his Star Trek movies too). But overall, I really liked it. I thought all the kids were really good–the chubby filmmaker was a natural–but the Joe Lamb kid and Elle Fanning were remarkable. It was his first role ever. Not a bad start, and she was only twelve. I’d have guessed older. Sweet chemistry. We also paid to see this in the theater and felt it worth it. Since we get to maybe 3 movies a year, TOPS, that tells you how I feel. Now I’m just wondering why we don’t have it on shiny plastic disc. To the Wish List!